Cape Jervis Lighthouse with dramatic red, orange and yellow clouds above catching last rays of the setting sun. The lighthouse marks the northern entrance to the Backstairs Passage between the mainland and Kangaroo Island. Located on the cape at Lands End, the tip of the Fleurieu Peninsula, about 1.5 km (1 mi) south of the town of Cape Jervis and 400 m (1/4 mi) north of the Kangaroo Island ferry terminal. Cape Jervis is the jumping off point for daily car and passenger ferry services to Kangaroo Island. It's a 45 minute journey that reveals the spectacular coastline of this part of the Fleurieu Peninsula. Cape Jervis is a popular base for fishermen, with good boat, jetty and beach fishing. Cape Jervis is on Tourist Route 52 and part of the Fleurieu Way Tourist Drive. This image belongs to the travel and nature stock photo library. 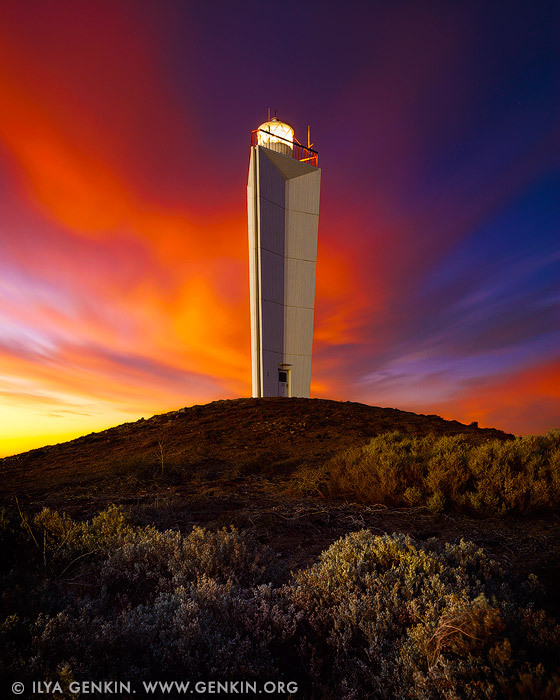 This stock photo of Late Sunset at Cape Jervis Lighthouse is available for licensing for commercial and editorial uses including websites, blogs, books, magazines, brochures and advertising. Restrictions may apply for images which contain third party copyrighted material or sensitive subjects. Photos of artwork are for editorial use only. This image id AU-CAPE-JERVIS-LIGHTHOUSE-0003 of Late Sunset at Cape Jervis Lighthouse, is copyrighted © by Ilya Genkin. This is not a public domain image.